I really enjoy the team aspect at Cancer Treatment Centers of America. We all work together to do what is best for our patients. Dr. Haritha Pabbathi joined Cancer Treatment Centers of America® (CTCA), Atlanta, as a hematologist-oncologist and medical oncologist in December 2012. Dr. Pabbathi earned a bachelor in medicine, bachelor in surgery from Gandhi Medical College in Hyderabad, India. She then completed an internship and residency at the Ichan School of Medicine at Mount Sinai, Englewood Hospital & Medical Center in Englewood, New Jersey. Next, Dr. Pabbathi went on to finish a fellowship in hematology and medical oncology at Lenox Hill Hospital, a part of the Long Island Jewish Health System in Manhattan, New York. 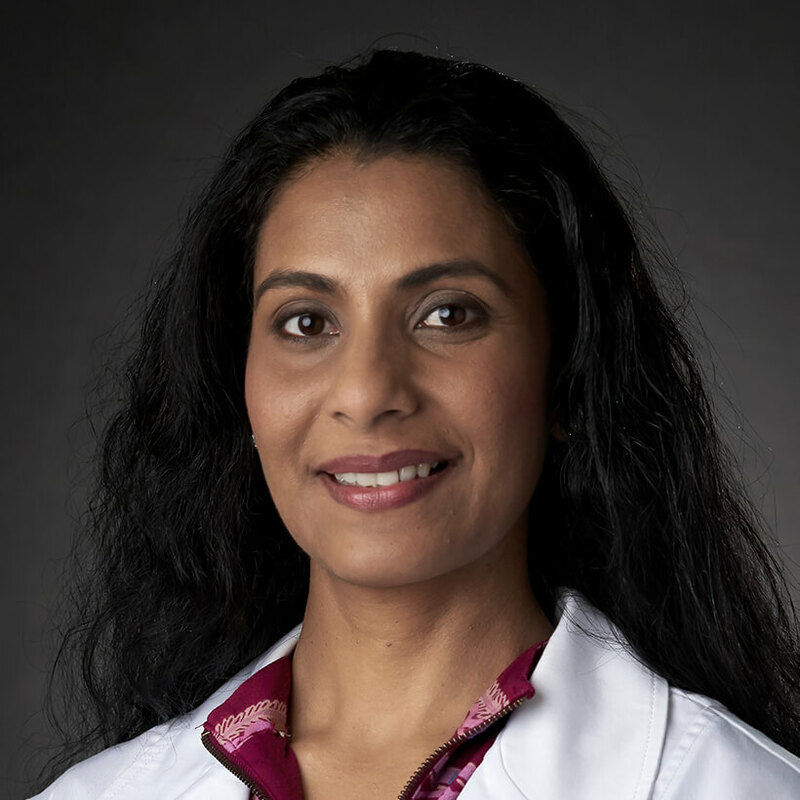 Since finishing her education, Dr. Pabbathi has served as an attending physician and consulting physician at two different hospitals in LaGrange, Georgia. She also spent time as a hospitalist in South Carolina. Dr. Pabbathi has always had a passion for oncology, which is one of the many reasons she decided to join the team at Southeastern. Dr. Pabbathi is board certified in internal medicine, hematology and medical oncology with the American Board of Internal Medicine. She is also a member of the American Medical Association, the American Society for Clinical Oncology and the American Society for Hematology, and serves as a member of the adjunct faculty at Morehouse School of Medicine in Atlanta, Georgia. In her free time, Dr. Pabbathi enjoys traveling and cooking. "always a long wait. this time we were going to miss our plane home waited for over sn hour. Ran in for a couple minutes while my wife had the driver wait. she is very competent but very over booked." "I am most pleased when I receive the numbers of my blood tests, etc. when visiting my oncologist. I would appreciate seeing the picture results on the computer of my PET scan and seeing the comparison against the past one." "I am very satisfied and thankful for the care that I have received." "Doctor was very knowledgeable and thorough"
"felt she was too busy to properly talk to me about my options for treatment. failed to explain her recommendations of treatment. She seams as she do not except feedback." "[...] My current oncologist is Dr. Pabbathi. She's nice also. She answers my questions if I have any." "I have and will continue to recommend your organization to friends and family." "[...] current not confident in her"
"Informed me on what I needed for my best treatments. I didn't have an understanding of all that she said, but she gave me paperwork to read, and I feel as time goes on, I will be able to understand more." "Very caring and concerned about me." "I feel dr pabitha gave me the second opinion I went there for"
"Very Caring Doctors who does not ignore my complaints and work to find resolution to my problems." "I was impressed until she tried to force me to sign a permission to treat statement before I had all the results from all the doctor's at CTCA. This action made it seemed like I was focus to do something against my will and for insurance purposes." "She has the personality of a rock, appears to be rushed, No warmth, doesn't smile has is matter of fact attitude and doesn't know anything about the[...] that she prescribed as part of her patients treatment." "*Dr. Pabbathi is a good medical doctor, but I feel she is not opened to other methods for treating cancer, symptoms or side effects. I don't feel she is a team player with the other doctors in other depts." "I'm very satisfied with Oncologist interest in finding out about previous tests, surgery, and origin of cancer." "I would give a 100 if i could"
"There were times when Dr. Habbathi came across as being a bit insensitive. [...][...][...][...][...] [...]"
"always answers all my prepared questions. I don't feel hurried"
"I don't think i was really listened to in the beginning. " "make sure you know what's going on"
"I have the best oncology team. Dr Pabatthi and staff are highly competent and always treat me with such compassion. A [...], she was able to get me a clinical study drug when I had lost all hope. I'm positive I would have never gotten it without her willingness to help me. I know without doubt that if I ever need another study/trial she will be right there to help me again. I have been given a second chance at life." "The Best ! She exudes confidence and jus make you feel at ease,I respect her opinion--so far so good as for my treatment plan!" "She's very competent and caring and reached out to my family." "very good knowns how too ans"
"*Dr. Pabbathi is wonderful could have not ask for a right on target conscientious doctor. She's awesome." "very professional and nice to me"
"I really don't have anyone else to compare my Oncologist to. However, I feel as though she had my best interest at heart." "I was very pleased with my overall medical staff"
"Dr.Pabbathi and her team are great,I have the utmost confidence in her!We have our sparring moments but she always wins,that way I know she hears what I have to say,always my best interest at heart!" "Dr Pabbathi is very professional and thorough and explains all treatment options." "my appointment never on time...makes my visit rushed. Talks to fast for me to comprehend to understand. I get misunderstood. Wish I had nicer things to say"